My spinach has done so well this spring that I’ve been enjoying it for well over a month and have shared it with several friends. I prefer it raw — in salads — when the leaves are small. However, it got crazy on me and grew big and not quite tender anymore. And that was the hardest part of the entire recipe. 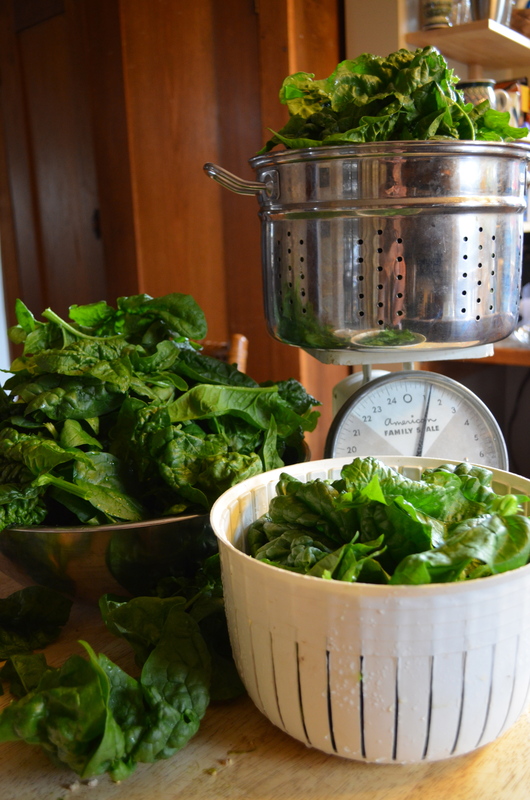 Spring greens from the garden — lettuce, arugula, spinach, cress — have the most labor-intensive preparation than anything else I grow. 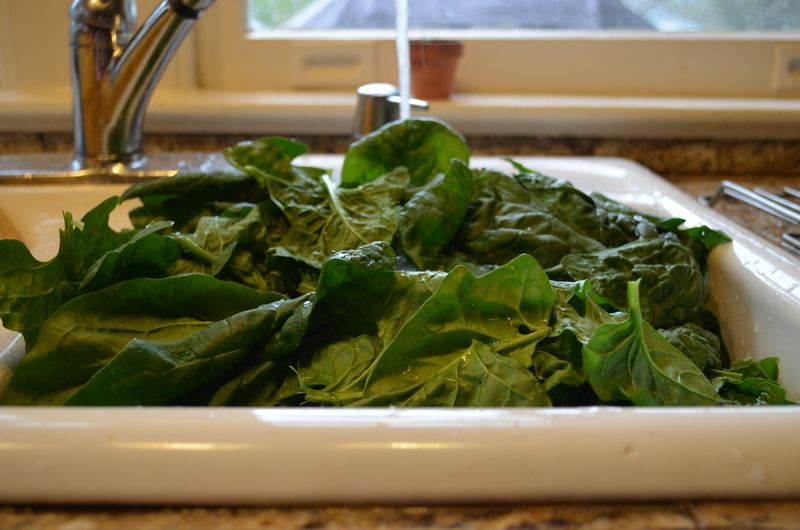 I end up washing them a few times then inspecting both sides of each leaf before eating or cooking them. It’s not the garden dirt that I mind — it’s slugs and cabbage looper worms that turn off my appetite. I know, I know, crawly critters are considered a delicacy and/or protein in some cultures. And their presence is a better alternative to nuking my plants with pesticides. Instead I raise our water bill considerably in the spring making sure my greens are critter-free. My boys love weighing our garden veggies on this old scale that belonged to my grandmother. It’s a trick great way to get them helping out in the kitchen when Preschooler Witching Hour is nigh (’round about 5:15pm). Here’s the final product, which was thoroughly enjoyed by both boys (even the picky one) — spinach this way is deee-licious. It was sweet, not soggy or bitter at all. (I’d taken the other croquettes out of the skillet before I took the picture — you can fit about 8 in there at at time. I think the whole recipe made about 18 — I’d doubled it). 1. Bring a large pot of water to a boil and salt it. Add the spinach and onion and cook for just about a minute, until the spinach wilts. Drain thoroughly and cool a bit. 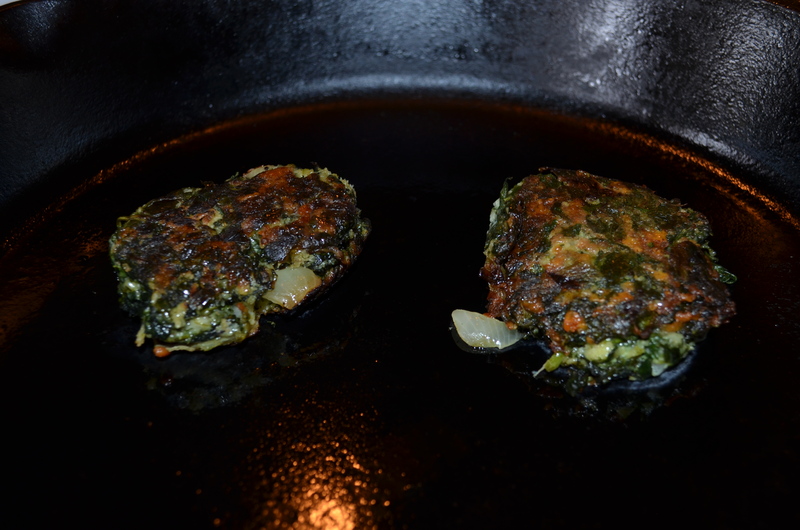 Chop the spinach and put it and the onion in a bowl, along with the eggs, cheese and bread crumbs. Mix well, then add salt and pepper to taste. If the mixture is too loose to form into cakes, add some more bread crumbs; if it’s too dry, add a little milk or another egg. I have loads of spinach too! I’m going to try this with some almond cheese. Thanks!